Egg slicers have got to the be the most underrated kitchen appliance ever! While it certainly serves its purpose slicing eggs into perfect, uniform pieces it can be used for so much more than that. A video from DaveHax shows us just exactly how useful this tool is! Whether its fruit, vegetables, or cheese--the egg slicer can make chopping up ingredients a much faster and more efficient task. Here's how it's done. Strawberries are small and can be difficult to slice. However, using the egg slicer can make neat cuts of strawberry perfect for many recipes. Wonder How To indicates that using an egg slicer makes the pieces ideal for layering a strawberry cake. 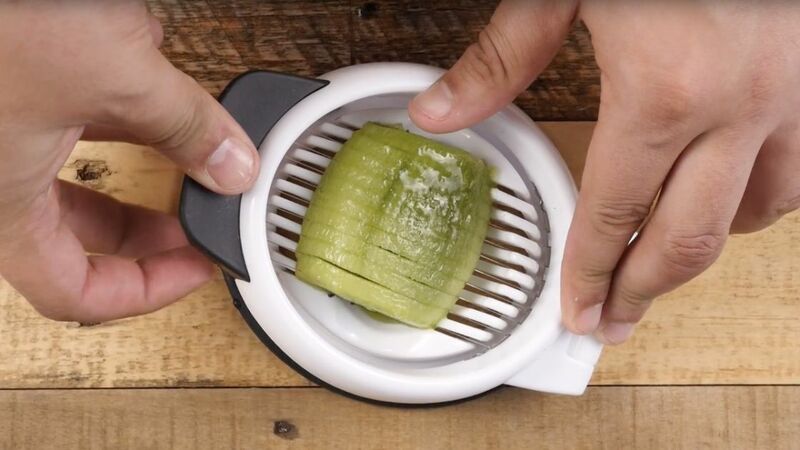 Kiwi is definitely a tricky fruit to cut, but an egg slicer makes it a much easier process. DaveHax indicates its best to peel the kiwi and then turn it on the egg slicer for a cleaner cut. Who doesn't love a good avocado? The mushy texture can make them difficult to cut, but an egg slicer keeps the avocado in place and creates neat slices perfect for a salad. Wonder How To indicates that it's important for mushroom slices to be thin for pizza toppings or for an easy saute. The egg slicer can be used to cut even the smallest mushrooms down into usable pieces. Love mozzarella, but hate the mess? You'll love using an egg slicer to simplify cutting. In a matter of seconds, you'll have perfectly thin pieces ready for your favorite recipe. Catch the video below for a step-by-step guide for cutting your favorite foods. Are you looking for your egg slicer now? You should be! Share these tips with your friends. As great as the freezer is for storing food and saving money, there are some things that should stay out.